Those extreme custom show cars you saw at custom auto shows when you were growing up are hot collector items today. 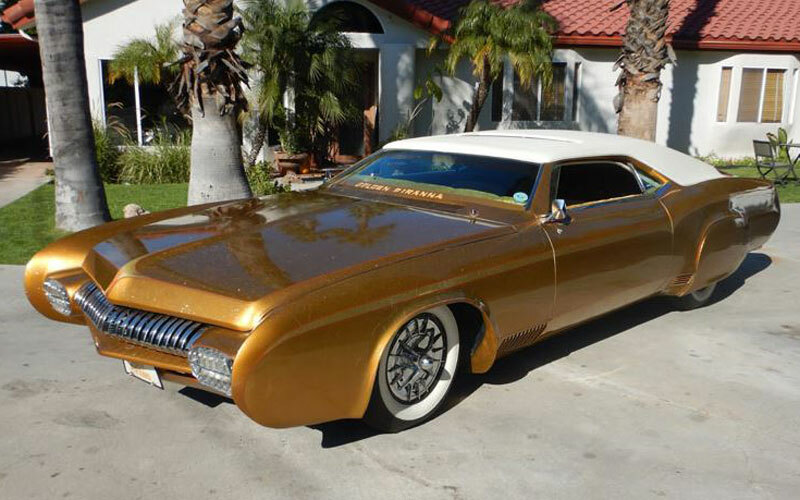 West Coast custom show goers will remember the Golden Pirhana, a 1966 Buick Riviera Custom show car built by Hall of Fame builder Frank DeRosa. It was one of DeRosa’s signature builds that brought him much notoriety in the custom car hobby. This week a private collector from Woodland Hills, California is offering the Golden Pirhana for sale at a very affordable price. It is an opportunity to own a real icon of the custom car hobby. This beautiful 1966 Riviera known as “the Golden Piranha” was built in 1983 and traveled the custom car show circuit for many years. The seller has links in his ad to some of the many published articles found on the internet about this great custom show car. (Follow the link to view the ad and photos.) DeRosa’s auto body shop was in Pittsburg, California where he created his famous custom builds, such as The King of Mercs, a 1951 Mercury, an example of the heaviest chop ever done on a Merc. He also built the Sharkmobile, a 1960 Cadillac that rivals the Batmobile by Baris. Frank and his son, Frank, Jr., have done work for John D’Agostino, Art Himsl, Gene Winfield, and Oz’s Customs at times. They are known for their radical custom chops. 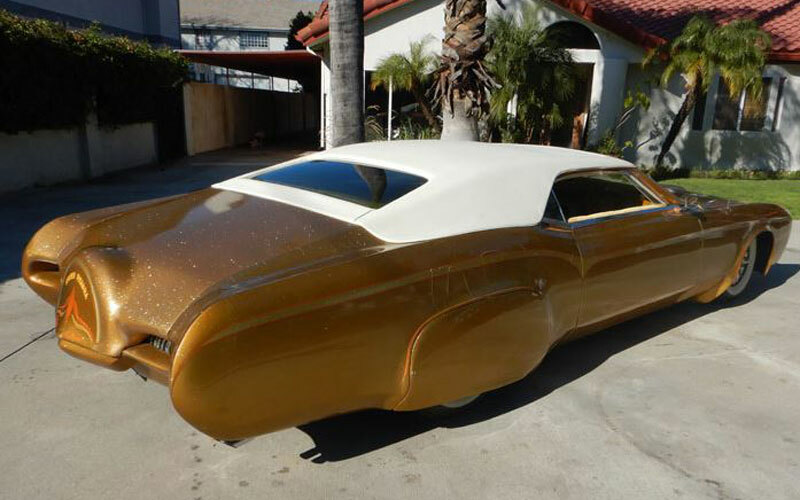 The Golden Piranha, as it would become known, was a popular draw on the custom car scene. Hot Rod Magazine did a two-page spread on the 1966 Buick Riviera custom in 1983, the year it was completed. It took two years to build. Many classic customs have a few modifications but are left very similar to the original. It really takes some imagination to create a completely different look as the one DeRosa designed. A low mileage Riv was found which had been sectioned 5 inches and chopped 4 inches. They used the padded top look right out of the ’50s. But they added a sunroof in the padded style top. The hood was peaked and V-ed at the front to match the ’51 Mercury grille. Then the lower grille was reshaped symetrically and rolled under creating a roll pan effect. There are no bumpers. Then the front fenders were extended and reshaped with rounded front edges. The small square headlights were fitted into hand made pods, then chrome plated to complement the Mercury grille. It all intricately fit together and worked. The DeRosas even made their own hubcaps which highlighted classic white wall tires. Frank did the paint himself. For the metallic look he used a Candy Apple Lime Gold and used crushed glass to ad sparkle into the first coats. His special blend of Candy Lime Gold was added over the sparkly base. Frank said there was no gold or silver under the base as was usual for these metallic candy coatings. He never revealed his secret to the lucious Golden sheen. 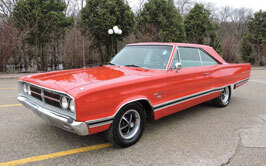 Frank showed the car for the next two years before selling it to a known collector. The Golden Pirhana found its way into another private collection around 1998 where it remained for about twenty years before it surfaced again. In 2018, the DeRosa family once again acquired the classic Riv. It seems that the DeRosa’s reacquired the cars to freshen them and sell them in restored condition. The crushed velvet interior styling might look a little dated today, but they respresent an era when customs ruled. Hopefully, this one will go to a museam . It deserves it. Frank DeRosa was born in 1929. He may have come along a little early to benefit from the custom car craze. He started customizing in 1943. He had worked for a local body shop owned by Bob Dughi before he went into the Navy. There he learned about welding and fabrication working on ships. He was especially talented and found himself running his own shop in Pittsburg, California by the time he was 25 years old. It was in 1949 that he opened shop De Rosa Custom Body and Fender. It was about that time that he was restyling a 1936 Ford that he had totaled. The car, known as the Joker Car, was 49 inches high, and it consisted of Lincoln, Kaiser, Chevrolet and Ford parts. He ran slightly afowl of the law because it was “too low.” He like it but the local police did not. So Frank gave up building customs for the time to devote himself to making money doing regular body work. But the stars aligned for the DeRosas in 1978 when Frank and his son, Frank Jr., went to the Oakland Roadster Show. Frank, Jr. asked his dad if he had ever worked on a custom car. That got Frank into thinking about building a custom car with his son. Together they built a few of the great icons in California custom car history. Follow this link to review the DeRosa builds as they are listed in Rik Hoving’s extensive custom car archives. The Sharkmovile, 1960 Cadillac custom, may be one of the most popular among custom car fans. But Frank most treasured his 1951 Chopped Merc called King of Merc and the Golden Pirhana. Those were the two cars the DeRosa family repurchased in 2018. Both cars were freshened at the shop. Frank DeRosa has been selected to six different custom car builder Hall of Fame lists. He and his son, Frank, Jr, were invited to help bulid a ’61 Caddy custom on the Discover channel’s Monster Garage TV show.